Japanese handsaws are quite popular nowadays so I thought I’d introduce those who may not be familiar, to a saw which I was offered last year. This saw was designed to rip logs into planks and, just like the western pit saw, has seen its use being reduced to almost nothing during the 20th century. It was the tool of choice from the 15th century to about 1950. The Ooga saw is large and heavy, really impressive in its size and drastically different from what I have always seen so far. Mine was bought on a flea market and sharpened and set by a specialized craftsman. The blade is hand forged with the characteristic tapering of the blade (blade is thicker near the teeth than near the top edge – which reduces the need for a large set of the teeth). You can also see that the teeth increase in size along the blade making for an easier cut in the beginning. I had to replace the handle as the handle that came with mine was completely rotten and falling to bits. I shaped mine out of ash which is not the kind of wood that would have been traditionally used but which is what I had. I tried to keep the same dimension and fastening method. Now for the usage, I tried it against a peach tree lumber which was lying around at my parent’s house and I have to say I was impressed. 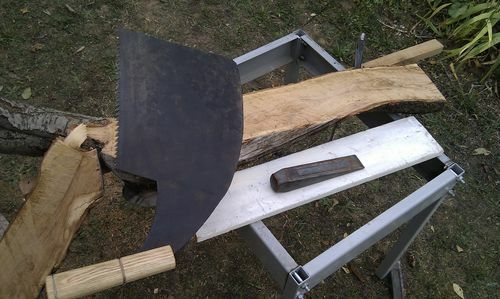 It took only about 1 hour to saw through the 9” thick trunk and I can say in honesty that about 60% of that time was actually spent in trying to find a proper way to hold the lumber while sawing it. Here is a picture I took from this website where you can see a really impressive trick : 2 sawyers are resawing a large log. 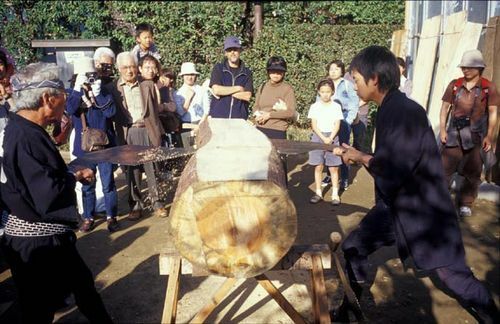 They are sawing with 2 saws, one from each side and are synchronizing their actions so that they can saw a log which may even be wider than the blade of their tools (it forms an X pattern when viewed from above). You will notice that they are holding their saw horizontally, which is a position I tried also when sawing through the peach tree. Actually, I started sawing vertically and switched to sawing horizontally in the middle and yet the saw cut was perfectly flat, rather amazing. Also, you will notice that they are really making the most of their saw’s length : the sawyer on the left has but the very tip of the saw remaining in the kerf at its outmost stage of the movement. I advise you to check at the above website, it is all in Japanese but the pictures themselves are interesting enough. Oh yes, I am also told that with these saws, you sometimes spend more time sharpening and setting the teeth than doing the actual sawing itself. I have heard that a skilled user will tune the saw by changing the set of the teeth (and sometimes the sharpening angle) to match different species of trees. OK, most of you will probably not be able to run and buy this kind of saw at your local home depot but I hope you enjoyed this review anyway. Thanks for posting this. Blake found a similar saw here in the US a while back. Here is his blog post. You may find it interesting. Thanks for the link Wayne, I did not know there was already a post about it. It looks like the Japanese characters in the name went down the drain. Funnily enough, they were displaying properly when I hit the preview button. Wonderful blog. Thanks for teaching us about something so exotic. Thanks for the review and link. Cool pics and some real skill involved. 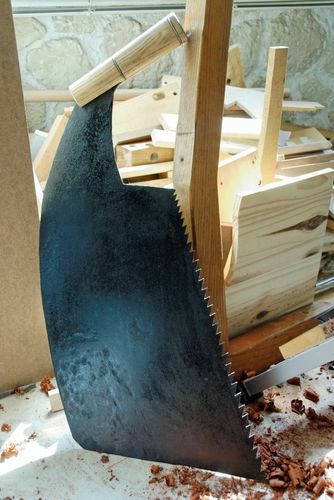 This type of ripping will make you get the most out of every piece of wood. What a cool find!!! I’ve seen these around at mom & pop tool shops but have never been able to afford one. I have a large ryoba that gets a lot of use and cuts really fast. Great job on the handle too. I think ash is an excellent wood to use. Nice saw and some interesting additional information from what I was able to gather. I love my saw but I’m content to let it hang on my wall. Bravo for actually using yours. I like that ink block painting of the Japanese sawyer. Where did you find it? 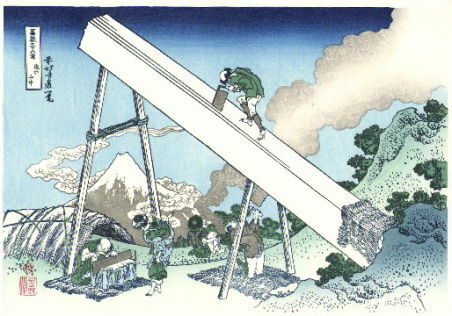 The woodblock print in the beginning is from the most famous ukiyo-e artist Hokusai (you know the famous prints with the mount Fuji you see everywhere, just search for ukiyo-e in google and your have 99% of chances that the first image that comes back is a print from Hokusai). For some reason the Japanese characters got mangled in my post but are left intact in the comment. So you can just copy/paste this into your google images. Now I’ve got these saws on the brain. This will likely not go away until I purchase one. I really appreciate you posting this interesting saw and especially the glimpse of lore behind it. You can see a craftsman using one further down the page.